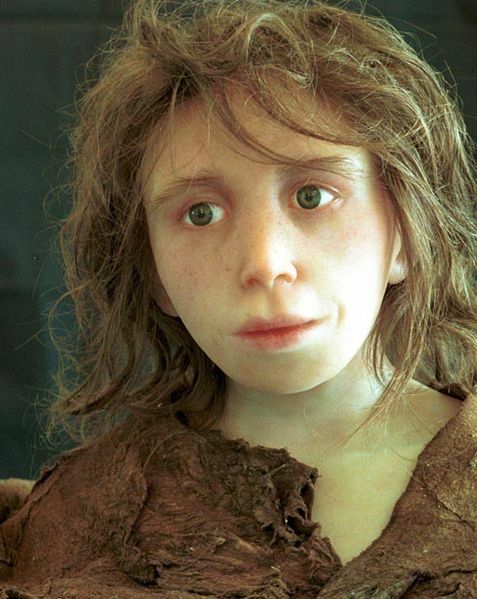 Last week at the Royal Society in London, research was presented suggesting that Neandertals not only interbred with H. sapiens sapiens, but that their genes were helpful to modern people moving out of Africa. This pioneering study was led by Peter Parham of Stanford University, and was only possible after the draft genome of H. neanderthalensis was published. The researchers looked at human leukocyte antigens (HLAs), genes important to the functioning of the immune system. Different regions of the world are known to have unique HLAs, because different variations create specific disease resistances. It would have been advantageous for the earliest modern humans to breed with a species (or subspecies) already adapted to living in a different climate. Moderns could have picked up helpful genes that were already in existence from Neandertal populations, which would have possibly allowed their populations to expand more rapidly. Why wait for random mutation when you can interbreed with a people already successfully adapted to an area? While only approximately 6% of the modern European genome was contributed from earlier hominins, around half of specific HLAs can be attributed to these earlier forms of people. As a form of further substantiation, Europeans have HLA variations present within the Neandertal genome not found in Africans. Interestingly, Asian populations today also have a variation not present anywhere else, which could indicate Denisovan (mystery Siberian hominin) admixture. As if the draft sequence showing interbreeding was not enough last year– this study has raised the bar on the type of information we can hope to glean from looking at ancient DNA. There was a time when archaeology and anatomy were the only windows we had into our ancestral relatives. It will be exciting to see what is uncovered next. What does that statement mean? I hear statements that we share 98% of our genome with chimpanzees, so what does this statement mean exactly? 1) How was this 6% calculated, by whom, and where can I find the source information used for this statement? 2) How were they able to sequence the Neanderthal genome if Neanderthals did not exist for the past 30,000 years? Where did they get the soft tissue from to do the sequencing? 3) Has the genome of enough individuals from every race actually been sequenced such that we can actually make statistically valid assertions about these matters? 4) Using this same type of analysis, what perrcent of the modern European genome would we expect to find was contributed be the earliest European Homo Sapiens? Would that be closer to 6% or closer to 100%? I need to have something to compare to. I hope that the New Scientist’s figure of “6%” does not stick. The actual estimate of admixture with Neanderthals of Europeans (French, Sardinians) is of just 2.4%, according to Reich 2011. Also what do you think of Hawks’ caveats? I’d say that he’s right on the allegedly “Neanderthal” allele HLA*C07:02, which is common enough in Africa (reaching to 15% among Baka Pygmies) to totally dismantle Parham’s claims in this aspect. On the other hand, the alleged “Denisovan” (probably a Erectus-Neanderthal hybrid) allele group HLA*A11 (01 to 04) is not found among native African samples, except in one from Kampala, Uganda, where it reaches relatively high figures: 4.3%. The case is unclear for that reason but the absolute lack of this allele group in any other populations of all Africa south of the Sahara (excepted Tamils of Natal and creole populations of Cape Verde and Sao Tome) makes it still a very good candidate for introgression. I discussed all this here. I appreciate your comment–and I’m wondering now, where did the 6% figure New Scientist wrote of come from? I’d seen estimates of something like 1-4% in the initial publication of the Neandertal draft genome, but I haven’t crossed paths with any higher numbers. After looking at Hawks’ blog, I’m very surprised. That would appear to be damaging if there isn’t some ample explanation. I’m curious to see what other commentaries are generated in response to the new research. Could the last remaining populations of Neanderthals have contributed to a greater extent to the genome of the human populations that exist in the same areas they inhabited. The more time for interbreeding to occur might have led to a greater regional contribution. Have any studies been done on this? I’m always left wondering how they manage to decide whether direction the gene flow went. It seems that it could always be in either direction. A gene variant arose first on European/nearby H. sapiens, and, through some mixing, it went into neanderthalensis. I think it’s arguable that the immunological advantage could have been even of more benefit to them than to sapiens, depending on how voluminous were the sapiens migrations and how often they would interact in some way that they could transmit diseases to each other. I’m not sure but I think that a similar thing probably happened within sapiens themselves. As Europeans went out of Europe colonizing the world, it seems that were the germs that they carried along the way, not the native’s germs, that could have exerted more selective pressure on natives, being selected in case of mixing, rather than the other way around. But I don’t really know much of epidemiology anyway. Perhaps it’s highly dependent on the volume of the migrations, the migrations out of Africa not being as voluminous as the later European colonizations, or something like that. I just find a bit hard to believe that selection was such that hybrid populations had some sort of advantage due to a handful of neanderthal genes, but subsequently most of the neanderthal genes were “thrown away” instead of remaining there just due to Hardy-Weinberg’s conservation principle. Are sapiens’ genes really all that awesome? Wouldn’t it create a much larger divergence of Eurasians and Oceanians from Africans, due to bottleneck effect resulting from such selection? Neanderthal mtDNA places them quite away from sapiens (and somewhat surprisingly just as close to everyone, if not closer to Africans), perhaps there were more seemingly neanderthal genes that are actually of sapien’s origin? It had to have ocurred in both directions at least to some degree I guess. I wonder how neanderthals from distant places compare with each other and these genes that seem to have introgressed in sapiens. Well, I haven’t really done any math anyway, just intuitively some scenarios seem a bit odd. And I’m not really sure it even has any relevance concerning the direction of gene flow anyway. I don’t even know at which frequencies such neanderthal genes are found in Eurasian populations, perhaps not being just nearly fixated already makes it seem less unlikely. Not that anything against having neanderthal genes anyway. Good thought process ds! It’s important to think outside of the box like this and consider all the potential directions that the evidence might point in, rather than just looking to the evidence to support a paradigm that most people have bought into with a herd mentality. Isn’t that the scientific method? Like the “out of Africa” paradigm. I can’t believe people still buy that when much evidence points to other history. It’s almost like we can’t get away from the racist past that inspired us to believe that black Africans are a closer evolutionary link to apes! For that matter, there’s no conclusive anthropological evidence that man even evolved from apes, unless you use a certain paradigm belief system bias to interpret the evidence to start with. We certainly have been guilty of building the most detailed of hypothetical scenarios of our past which we present as factual history, even though it is based mostly on our imagination and the sketchiest evidence. i think the 6% figure is a quote from one of the researchers when asked if there was something of a maximum estimate, (more then a probable estimate). for example the two share genes, and whom of the two contributed the particular gene is statistical. I think it is a great idea for a new Republican health plan…You don’t need insurance…just breed with an extinct human species! As long as its not homosexual in nature. That would not go over well with God! I have always thought it bizarre that people just thought one of these humanoid creatures just stopped existing one day and the other began. Of course there were thousands of years of breeding between the Neanderthals and whatever we are today…It must be very difficult if not impossible to draw the line.